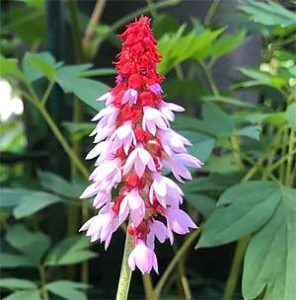 A truely spectacular species, Primula vialii with its two tone red and purple flowers is sometimes called the Chinese Pagoda Primrose. It grows well both in the garden and in containers however it does need a proceeded position from the hot sun and moisture through the growing season. If you can provide a humus rich moist yet well drained soil and a cooler position in the garden, then this is a standout plant. Plant in a well drained humus rich soil. Mulch around the plant with sugar cane mulch or similar. Keep moist through the growing season. Each winter, top dress around the plant with aged cow or sheep manure and renew the mulch. You can liquid fertilise with an organic type solution in spring and again in early summer. Generally not required other than a tidy up of spent flower heads if desired. Clean up the old foliage as it does back into winter. Winter to early spring is the time to dig and divide these plants if desired. Common Names – Chinese Pagoda Primrose. Plant Spread – Will form a clump over time. Position – Dapped shade, morning sun. Soil – Well drained humus rich with some moisture. Flowers – Two toned red and purple.